"Houston, we have a problem". Truer words were never spoken when Jim Lovell chillingly announced to NASA that the Apollo 13 space mission had run into difficulties. Ron Howard's impeccable dramatic recreation of the disaster blends top notch technical credits with a fantastic cast, headed by Tom Hanks, Kevin Bacon, Bill Paxton, Ed Harris and Gary Sinise. The film was Howard's fourth collaboration with composer James Horner, who was experiencing an extraordinary purple patch in his career at the time. James Horner had a blindingly good year in 1995, composing six (yes, six) movie scores. Presumably he had time to finish his breakfast every once in a while. Two of these scores are certified masterpieces (Apollo 13 and Braveheart) while the others veer from excellent (Balto) to good (Casper) to mixed (Jumanji, Jade). Braveheart has understandably stolen the limelight in the intervening years with its bombastic pipe and orchestra arrangements becoming an instant staple for film music compilations and intents of heroism. However for a score that flies its flag somewhat more subtly (although no less nobly) we have to look to that which accompanied Ron Howard's recreation of Apollo 13. Howard received probably the greatest acclaim of his career to date with Apollo 13, drawing considerable praise for underscoring the immaculate technical credits with quiet patriotism and genuine heart. Well with wholesome Tom Hanks in the starring role, what did we expect? Horner's calmly dignified score meanwhile is another of the movie's key attributes. 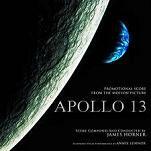 Horner is a composer frequently criticised due to his self-plagiarism but there's none of that in Apollo 13. Like Braveheart and his other masterpiece Legends of the Fall from 1994, Howard's film clearly inspired the composer to pull something great out of the bag. Tonally, the music is consistent with previous efforts but the music itself is all original, bar a couple of snare drum riffs from Glory. 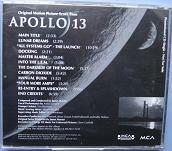 One qualm existing with Apollo 13's regular album release (the one featured in this review) is in its presentation, mixing several cues of Horner with dialogue excerpts and source music from artists like Jefferson Airplane and Jimi Hendrix. It's a testament to the power of the score that it comes across as well as it does given these constraints. The "Main Title" is one of the composer's most understated, a graceful trumpet melody (performed by the great Tim Morrison) speaking of the American Spirit, of the Space Age and of discovery. It's referenced very little in the underscore proper but forms suitable bookends, and its lack of mawkishness is a big relief (Horner's intention was instead to score the documentary idealism of the film). The lengthy warm tones of "All Systems Go/The Launch" transform into one of those classic 'building' cues Horner does so well, holding the listener's interest over a lengthy track as the astronauts depart on their doomed venture. The trumpet again is aglow with patriotism, prepping us for the sudden shift in dramatic tension in the midway section of the soundtrack (and film). The thrilling action that explodes in "Master Alarm" casts an immediate dark shadow over the space expedition, with rapid snare drum clusters and Horner's fearsome 'crashing' piano (heard in The Pelican Brief) creating a suitably claustrophobic atmosphere and shattering the earlier idyll. "Into the Lem", the next Horner track, thus proceeds in a much gloomier fashion, the strings, percussion and trumpet coming off more pensive as the protagonists are forced to confront their dangerous situation. "Darkside of the Moon" changes the tone of the score yet again, to that of ethereal, haunting beauty as Annie Lennox' eerie vocals precede the arrival of the full orchestra. Here is where the "Main Title" arrangement makes a most prominent and moving appearance, sounding a lament for the failure of the mission yet celebrating the heroism of the characters. Then we arrive at the score's quite simply magnificent conclusion, Horner pulling out all the emotional stops (as he frequently does at the climax of his albums) as the ill-fated ship makes its journey back to Earth. "Re-Entry/Splashdown" brings out the electronic choir/orchestra combo in spine-tingling fashion, underpinned by nervy snare drums as those on the ground await the craft's arrival (there's even a motif in there to be stolen by Horner himself in Enemy at the Gates in 2001). Things quieten for a bit before the triumphant, anthemic second half really brings tears to the eyes. The "End Credits" then bring in a pulsating, electronic beat beneath Lennox' vocals (far more appropriate a tactic here than in Titanic) before the beautiful choir and eventually main theme rounds off the score, allowing the listener (and those involved in the film's real-life dramas) to look in hope to the future. 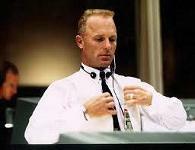 Horner really hit his peak in the mid-90s with scores such as Apollo 13. Titanic may have scooped the Oscar glory a couple of years later but this is arguably a far more accomplished work, having to bridge the dialogue heavy sections of the movie with graceful verve, and without reducing the film's narrative to the level of tawdry melodrama. 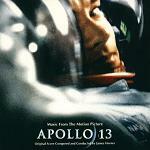 In an outstanding year for film music, Horner's work on Apollo 13 soared with the best of them. The release history of the Apollo 13 soundtrack is multi-faceted. The regular release is readily available for purchase on Amazon. It was also released as a Gold edition with more sound effects. There was also a promotional, score only, CD for the 1996 Academy Awards, featuring an additional 15 minutes of score. Unfortunately, this never received a commercial release, and instead lingers around the secondary market. 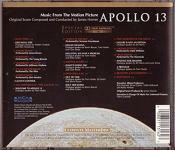 At the same time as the American release of the regular CD, a 2 disc version was released for the Australian market – Disc 1 was comprised of Horner's score, Disc 2 featured additional rock songs.